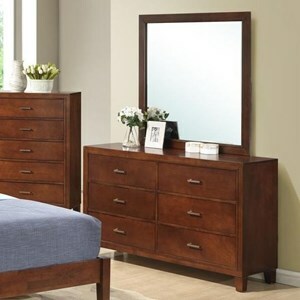 Update your bedroom with this dresser and mirror set. 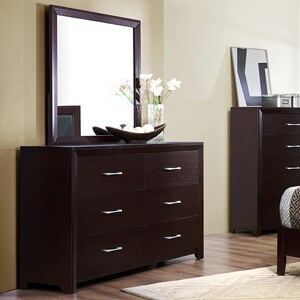 The clean, mocha finish blends the dresser and mirror together for a casual look, while the handle free drawers create a sleek, contemporary feel. The dresser Includes six dovetail drawers and ball bearing metal drawer guides for long lasting functionality. 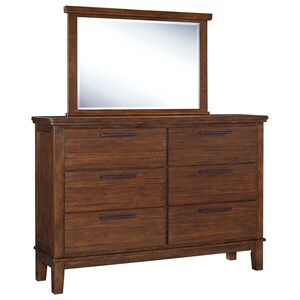 The Austin Casual Contemporary Dresser and Mirror Set by Klaussner International at Beck's Furniture in the Sacramento, Rancho Cordova, Roseville, California area. Product availability may vary. Contact us for the most current availability on this product. The Austin collection is a great option if you are looking for Contemporary Casual furniture in the Sacramento, Rancho Cordova, Roseville, California area. 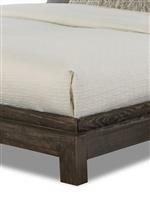 Browse other items in the Austin collection from Beck's Furniture in the Sacramento, Rancho Cordova, Roseville, California area.